Explosives give way to church bells as Christians return to celebrating Mass in Mosul, Iraq, after the defeat of the Islamic State in the region. To celebrate the occasion and the reclaiming of the city, a new crucifix was installed in the parish in order to replace one broken by Islamic State forces. MOSUL, Iraq - Two years after the sound of church bells was replaced by the sound of explosives in Bashiqa, Iraq, just north of Mosul, Christians are again celebrating Mass after forcing the Islamic State out of their homeland. 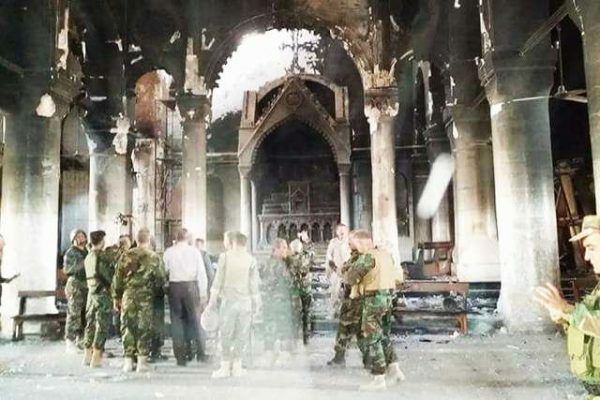 Christian liturgies have been celebrated yet again in the Church of Mar Korkeis, after Bashiqa was taken back by Kurdish Peshmerga fighters November 7, according to Reuters. The event marked the first time that Christian liturgies were permitted in the town since it was seized by the Islamic State in August 2014. Once the area was taken by the Islamic State, minorities such as Christians were forced to choose between persecution, conversion, or fleeing to autonomous Kurdish-controlled regions nearby. After taking Mosul, one of the largest cities in Iraq, Islamic State leader Abu Bakr al-Baghdadi declared a caliphate within Iraq and Syria. Christianity has been present in the Nineveh plain in Iraq – where Mosul and Bashiqa are located – since the first century. However, since the ousting of former Iraqi leader Saddam Hussein, Christians have been fleeing the region. The Islamic State takeover of Mosul drove Christians from the area for the first time in almost two millennia. To celebrate the occasion and the reclaiming of the city, a new crucifix was installed in the parish in order to replace one broken by Islamic State forces, Reuters reported. While Islamic State fighters have been pushed back, explosives and mines still riddle the town, and Bashiqa remains unsafe for civilians, said Kurdish Peshmerga Brigadier General Mahram Yasin. “We want people to be patient and not to return here until we completely clear the area, as we want to ensure their safety,” he told Reuters. Father Afram, pastor of the parish, told Reuters that after the city returns to normal, he would like it to remain under the control of the Kurdistan Regional Government (KRG), rather than the Iraqi government. He mentioned that the KRG is closer in proximity and has been much more involved in the protection of the region since the fall of Saddam Hussein’s regime in 2003.